We are located in Franklin - right outside Nashville, TN! Are the puppies raised in your home? Yes! We think it is best for the pups to not only be with their Mom for as long as possible, but we also think raising them around our kids makes for great dogs! They will learn to bark, run and eat from Penny (and Uncle Milo, our male) & they will be handled by my husband and I and our two little girls from day one! Are your puppies hypoallergenic? Do they shed? How much are your dogs? Great question! This includes 3 vet visits where they will receive the necessary medications and immunizations prior to going home at 8 weeks. This also includes a copy of our New Puppy Guide, as well as a puppy collar! We will also take a few photos of your “Gotcha Day” upon pickup if you would like. I paid my deposit, when do I get to choose my puppy? Puppies change SO much in the first 5 weeks of life. They learn to walk, bark and find their own little personalities in that short time! Their coats also change and often they change colors slightly and their curl pattern becomes much more obvious. So for these reasons, we hold off on selecting puppies until then! Around 5 weeks, we will go in order of deposits received and allow families/individuals to choose their puppy. So the first deposit received, gets first choice and so on! However as you can see from our litter last fall, all of the puppies grew into beautiful pups so I have no doubt that regardless of your “place in line” you will go home with the most perfect puppy! Can I come meet you and the puppies? Yes please do! 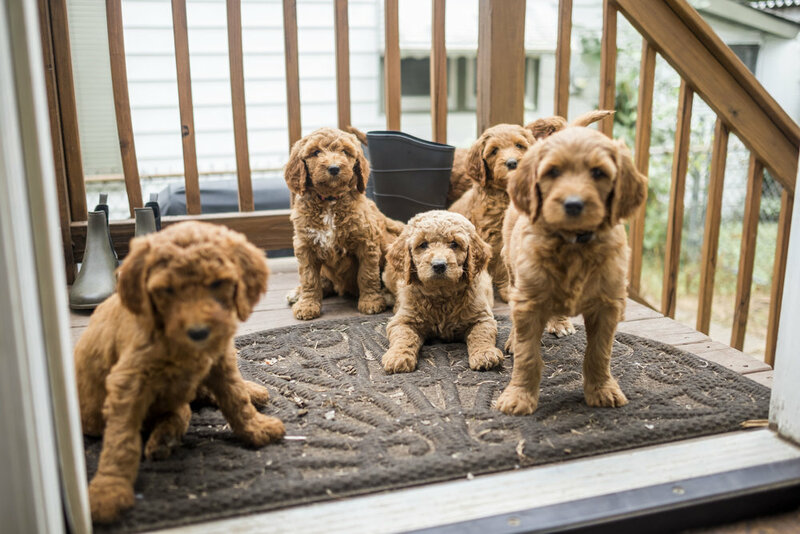 If you are local (or up for a drive) you can even come over to meet the pups at 5 weeks and choose your puppy in person! In fact, we highly recommend it! 8 weeks is so long to wait! How will I make it until then? I agree, that is a long time to wait to hold your new puppy! During the wait, we will send you photos of the entire litter so you can watch them grow! Then once you have chosen a pup (at 5 weeks) we will continue to send a few photos of just your puppy! It doesn’t shorten the wait, but at least you have a few cute photos to help make it a little easier. Have a question that isn’t answered here? Feel free to contact us directly and I will be happy to answer any question for you!